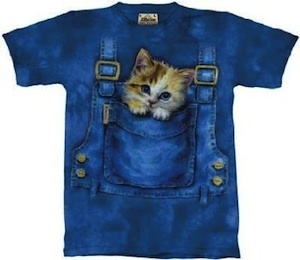 Now you can carry you kitty in your pouch off your overalls. Of course not for real but just printed on this t-shirt. And just in case you wondered it comes in kids and grownups sizes. So if you like kitties look no further and go get your own Kitty Overalls T-shirt.